Surely you all know of the existence of Gears of War . It is one of the games for console and PC with better graphics of the moment and with millions of fans in all markets. This week E3 has been celebrated in Los Angeles and Microsoft has left us with great advances for 2019. One of the most important for our operating system is Gears Pop . It is a game of Gears of War for Android based on Funko characters . Yes, these figures that are famous all over the world and that have giant heads. There are of all types and the truth is that the company has agreements with hundreds of movies, series and videogames. Now he is also entering the world of videogames and in 2019 he will launch his most ambitious collaboration with Microsoft. It is a Gears of War but with more animated atmosphere and being all his characters Funko figures . The most important names of the saga will not be left on the road, although we will not see them as usual. Adapting Gears of War 4 for mobile devices presents many problems for the company, so it has decided to please its fans with a game for mobile platforms much more animated. At the moment we do not have details of the gameplay or the game modes that it presents, but all its characters will be Funko . They will have small bodies and big heads. It may be a very strange mix, but the progress that has been seen in E3 leaves us wanting more. 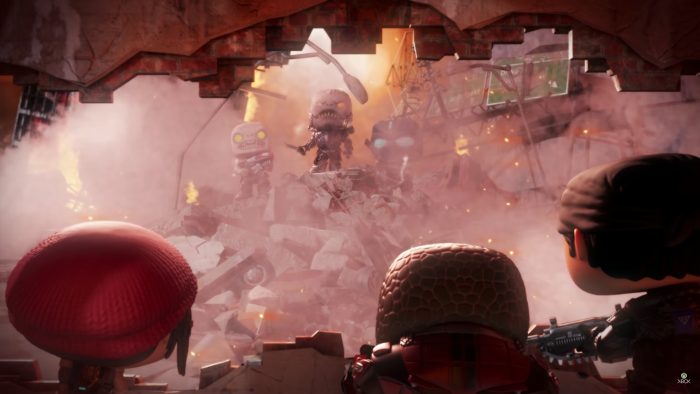 In the trailer you can see details such as weapons characteristic of the game or characters that carry several deliveries. The graphics will shoot for a more animated aesthetic, although they will not leave anyone indifferent. Although we still do not know the details of the gameplay , the video leaves us with important details. Enter 3 characters known from the saga, which, face 3 other evil characters. This lets us think that it can be a turn-based game and not something like Gears of War 4, where we can pass a story mode in the third person. We will see if before its launch the company leaves us with more details about Gears Pop , although the bad news is that we will have to wait many months to play it.